If you’ve read my reporting on electric vehicles, you’ll know I think plug-in electrics are the future (the distant future? – ed.). But some companies are putting product out too early, just to say they did it. 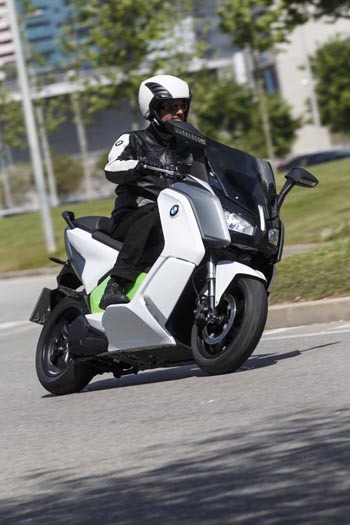 Behold the world’s most expensive production scooter, the BMW C Evolution, introduced April 30th for the European market after a long development process. It shouldn’t be a shock (heh, heh) that BMW released a production electric scooter. 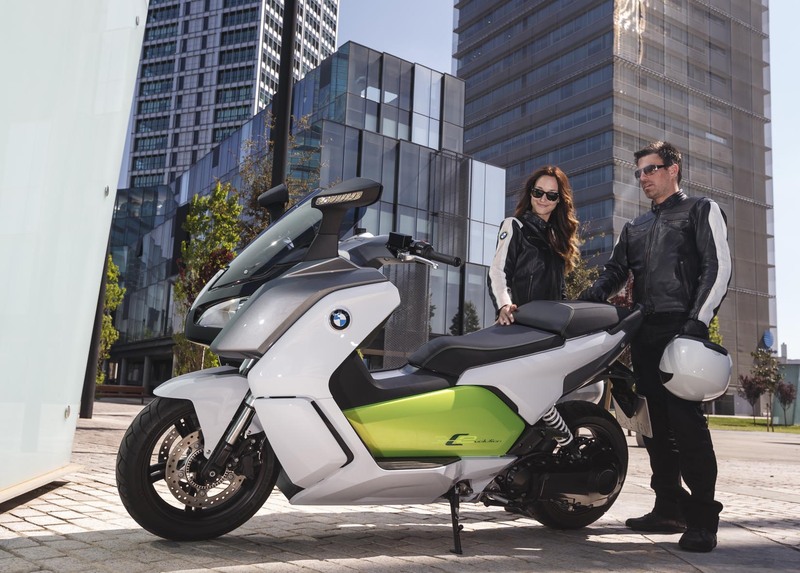 It’s also one of the first automotive companies to build an all-new, battery-electric vehicle from the wheels up (as opposed to just electrifying an existing internal-combustion vehicle), and utilized similar technology with the C.
If you don’t follow the wide world of scooters, you should know that BMW re-entered the scooter market for 2013 with the C 650 GT and C 600 Sport, creating an “urban mobility” line. That group of products will be environmentally friendly, fun to ride and generally take advantage of cities getting more congested—and affluent. An electric vehicle also makes a lot of sense in that environment, no? The C evolution looks a lot like the C 600, but it shares little besides design language and a few parts. Instead of that Kymco-built 600cc gasoline engine, it uses a liquid-cooled permanent-magnet synchronous motor with a peak output of 47 horsepower, good for a (limited) top speed of 75 mph. An air-cooled 8 kilowatt-hour, lithium-ion battery is housed in a cast aluminum structure that makes up the main component of the frame. Range is claimed at 62 miles (no word on if that’s city or highway riding), and recharge time from a 220 outlet is four hours. ABS and a traction-control system called “Torque Control Assist” come standard. BMW also seems proud of offering a regeneration system that charges the battery when coasting as well as braking. It’s studded with luxury features. The tall back end is due to a large bucket under the passenger seat big enough for a helmet, and a full-color TFT display shows energy capacity, discharge rate, range to empty, regeneration and other useful data. Heated grips are standard, as are four riding modes, including one called “sail” that suppresses the regen so the rider can coast freely on trailing throttle. And to handle the heft of the 590-pound electro-behemoth, there’s even a reverse mode to help back out of parking spaces—something shorties will appreciate, given the 30.7-inch seat. Here’s the breath-taking part: European prices are around 15,000 Euros, almost $21,000 in actual money(assuming a direct conversion of Euros to U.S. dollars is indicative of the potential U.S. price, which is frequently not the case – the U.S. price is often lower, and sometimes much lower – ed). Yikes. That’s a lot more than even the highest-spec Zero, which has more than double the range, a lower seat, is about 190 pounds lighter and tops out at over 100 mph. the Brammo Empulse is also cheaper and better-performing. To be fair, European countries include taxes and other fees in MSRP, and there may be incentives available that would bring the numbers closer to Zero and Brammo’s. It’s still overpriced, and the problem is BMW has been developing the C evolution for several years now, an eternity in the EV world. That makes me think this is more an elaborate and expensive marketing exercise than an actual attempt to grab market share. I’m told by a source that BMW North America isn’t interested in bringing the C here, but you can bet this won’t be BMW’s last attempt at an electric two-wheeler. Either those folks are short or that is one big scooter! While this bike doesn’t particularly make a lot of sense, there sure seems to be a lot of folks here who oppose electric bikes just because. They aren’t tourers, that’s for sure, but as a commuter they’re fairly practical. I don’t have one, but there’s a fellow at work who rides a Zero most days. Why would it be expensive, because everything BMW sells is expensive. A $20K scooter isn’t that shocking from BMW, I wouldn’t buy it, but I wouldn’t spend $22K on a 1200GS either. It’s a good bike, it’s just not $8-10K better than the other bikes out there. I realize the base list is less, but dealers don’t carry that, or really want to sell it. Wow, you’re one tough crowd… Here’s my $0.02 and sorry it’s a bit long. I don’t think anyone of you has driven this thing. I have (last saturday) and for transportation in and around the city it’s a great solution. It’s quick, has the lowest centre of gravity ever and brings a smile to your face, especially with 72 Nm of torque at 0 rpm (I have no idea what that would be in foot pounds). It might not be available stateside, but it wouldn’t have been 20K either. Over here in Holland, with a whole bunch of different sales taxes, it will be € 15.250,-. That’s including 21% sales tax, plus the possibility of getting 36% of the net amount returned from the tax officials in something called an ‘environmentally friendly investment program’. So, we’re under 10k then. Those programs are in effect across Europe. One liter of 95 petrol (minimum for a BMW petrol scooter) will set you back € 1,75 here. That’s an average price for Europe. That results in $8,49 per gallon. Are you starting to see why this scooter would be a viable option? One KWh is around € 0,23, which would make a ‘full tank’ for this BMW around 2 euros. The electric drive train needs nearly no maintenance compared to anything with a petrol engine. I’m motorcycle driver, and have been a long time. I won’t be caught in a car. But I can see this concept working. Maybe this one’s a bit too early range wise, but otherwise it works like a charm. You can keep on trashing the idea, but the long term availability of petrol will not improve. We’re all heading towards that brick wall, and I applaud BMW for coming up with an alternative. However unattractive it may seem to you at this time. Both the Zero and the Brammo are more expensive than this Beemer in Europe. Plus: all three have very heavy batteries, but this BMW has them almost as low as street level. That makes the COG so nice and low. I could go on, but you’re probably the wrong crowd anyway. Maybe look at it this way (I’ve read this in a test of this scooter): we’re all used to pushing a button in an elevator and be zipped towards the 92nd floor with no drama. Just smooth and quick. Now imagine the bell boy turning a key every time, after which a combustion engine would come to life. After a bunch of throttle blipping, clutching and putting the transmission into gear, the elevator would start moving with a jolt, to deliver you, after switching gears some 5 times, in a cloud of smoke to the desired floor. Now compare that to your two wheel experience. To see the advantages of electric you’ll have to have a bit of an open mind, but this BMW rides like your everyday smooth elevator. I think 99% of riders would NOT buy one at that price, so it will fail…….its simply unrealistic. Wrong. oil availability is not going away. Your fuel prices are so high because your idiotic government tax the crap out of it. Oil is plentiful. Oil is cheap. The earth will never stop producing oil. We will never run out. Get over it. Oil is not more expensive because of taxes (though it would be good if it were taxed more), it is more expensive because the middle east is drying up and we now extract it from tar sand @ $60-80/bbl, a price that was 2-3x higher than acceptable 10 years ago. We may not “run out” but price will go up & access down until it is impractical for regular folks to use as fuel. The earth doesn’t produce as fast as we use. I want a COAL powered motorcycle. While riding my BMW 1150GS a few weeks ago I got into a traffic jam. While power walking it my prosthetic leg fell off. the people behind me helped me out. It was then that I decided that I should sell it to get something lower to the ground that I could honestly flat foot. So, I found a nice used Honda Silverwing scooter. Just the right height. For comparison I went to the BMW dealership and sat on their scooters. Those things felt just as tall as my old GS. What are these guys? Giants? Are their no short people in Bavaria? I could never raise my 31″ inseam legs high enough to even sit on the GS Adventures in the show room. I think that the whole goose stepping thing may have prepared the Germans for that stretch. It is long past time for us to fight back against the invasions of tall motorcycles. Otherwise our children will never know the freedom of riding the American way, and byways. The scooter may be a joke, but so is this article. Converting Euros to Dollars as a method of predicting selling price is one of the biggest mistakes possible. If everything was based on the exchange rate, these scooters should cost over $13,000 in the USA instead of actually costing less. Prices on global products are always set on a per market basis and never via a flat exchange rate. Given the approximate ratio between the USA price and Euro price of the existing gasoline scooters, I would estimate the new C Evolution would list for about $12,900 in the USA. Yes, $12,900 is still expensive for a vehicle with a 60 mile range. But over exaggerating the selling price by almost double just to make a vehicle look bad is really shoddy journalism. Hi Nick, In today’s spot market 1 Eur = 1.39 US dollars. I struggle with your math. But I still like the bike. I think that the Urban or Suburban market has a place for E vehicles. Maybe not the open road. But if I lived in the city, I think that I could enjoy a nice quite ride to the store. The point is that the exchange rate is not the math that they use to set prices globally. They sell at a lower retail in the US based on the cost that they believe the US market will bear. Exactly Dave! Compared to Germany, BMW GS’s are more expensive in the US and BMW scooters are cheaper in the US. Contrary to the USA, cars and trucks in the rest of the world are usually cheaper with a diesel motor and the gasoline option is the expensive upgrade. A much better rudimentary estimate for regional pricing of a global product is to simply change the currency symbol without calculating the currency exchange. A helmet will cost $250, 250 EUR, and 250 GBP in the respective countries. A motorcycle would be $10,000, 10,000 EUR, and 10,000 GBP. 1 – this is a marketing coup. it means that bmw can trade on environmental kudos, even if they’re selling wau more IC engines than anything else. 2 – this is a product test for the future. you can be sure that dealers who sell these will be giving the customers alot more attention, including their real world experience of living with an electric vehicle. I don’t see bmw ceasing anything they’ve always done, and you should be able to see that. motowarrior..do yourself a favor. Go test ride a 2014 Honda CB 1100 DLX if in the US and EX if you are in the rest of the world. You can thank me later. Electrics are fine, but I like the smell of gasoline in the morning. Smells like a Victory. Victory bikes smell like desperation, not gasoline. …afternoon, evening, etc. and then (in no particular order from the distillation column) there’s #2 diesel, #1 kerosene, and ether. mmn mmn, that’s some good smellin’. I don’t see the point of going electric on a vehicle that would get 60 MPG on gas anyway. I need an electric 3/4 ton pickup to replace the one that gets 15 MPG..
Trickle down. Perhaps your truck will benefit from the developments of this electric scooter indirectly on day… if we’re lucky. Now we just have to develop wind and solar so that you can energize your batteries with it instead of from coal burning electricity generating plants. Coal bad… wind / solar good. What, you’re still using coal? I think the states that electrics sell well in are the more -progressive- states that don’t use coal anyway. Won’t be too many electric scooters driving around Wyoming. …aren’t states at all, they are “bays”. service bays…? director Michael Bay…? not so much, the Bay Area. Toyota’s entire production of Mk1 Priuses can be found circulating within a 50 mile radius of ‘Frisco. and there it is… err… there they are. I would agree with BMW of North America. Can see no reason to bring this in when there are full size motorcycles that weight less, go further, and for sure cost less. Oh, there might be a few, but too few to make it worth while I would think. me…? I only use lithium for the radial monoblocks on my grandprix bike. it’s just how I roll… err… how I stop. Plug-in electrics may be the future, but never forget that the energy to charge those electric vehicles comes from ….. you guessed it, KING COAL! 1. Not everywhere uses coal for the majority of poser generation. In Germany, France, California and the Pacific Northwest it’s almost all nuclear, natural gas, wind, solar and hydroelectric. 2. Even if the electricity is 100% coal, there is still less carbon emitted per mile traveled, as th eelectric powertrain is much more efficient. 3. Even if what you’re saying is true, it’s a better argument for developing alternative and renewable energy sources than for not using battery-electric vehicles. Poser generation, ha, ha! I meant power generation, of course. Actually, given the bike we’re talking about “poser generation’ could be a Freudian slip. This bike seems to be aimed are the people who want to make a big show out of being green. This might be your perception Goose but I can tell you I live in an extended community of very green thinking people (Kootenays region of British Columbia) and not one that I know of give a damn what you think of them… they just feel strongly compelled by circumstance to do their part in slowing the apocalyptic trend we’re in right now. Not that any one of them would afford this new offering from BMW but it’s nice to see the development anyway. Go BMW. Daytona, My comment wasn’t aimed at all Green people, just the one who buy this toy. There is something about this discussions about the cost of things… not what you pay but what the environment suffers as a result of things. There is no coal power generation in the Pacific NW as Gabe said. It’s mostly hydro, with some wind and solar mixed in. Does it come with an urban redhead? Not sure, wish so, can I ask for Tori Amos specifically? What makes these things worthless isn’t the range or speed but the recharge times. That means you can ride 25 miles from home and then you have to turn around because you’re not going to find 220 out on the road. It’s just a toy to burnish your green cred with your fellow idiot neighbors. Actually, you’ll find 220 out on the road all over the target market of Europe. Hard to imagine from the center of the universe, but the rest of the world isn’t just America with unfamiliar accents. Actually, even the stone age US is catching up. Tesla is building “Super Charger” location all over the US. Given the size of the country it will take a while but now at least the Interstate highways are getting covered. I hear the South will be last to get them, something about “No durn ‘electric cars in the bible”. So Goose, tell us how long it takes for a voltage recharge in the middle of the USA when your Tesla($100K) shuts down, please, when you’re driving it long distance. Or is the Tesla just made for local short trips like all other electric vehicles right now? A Tesla recharges is roughly 20 minutes at a Super Charger. Under 5 if you chose the battery swap. BTW, the next Tesla is planned to be $35K. 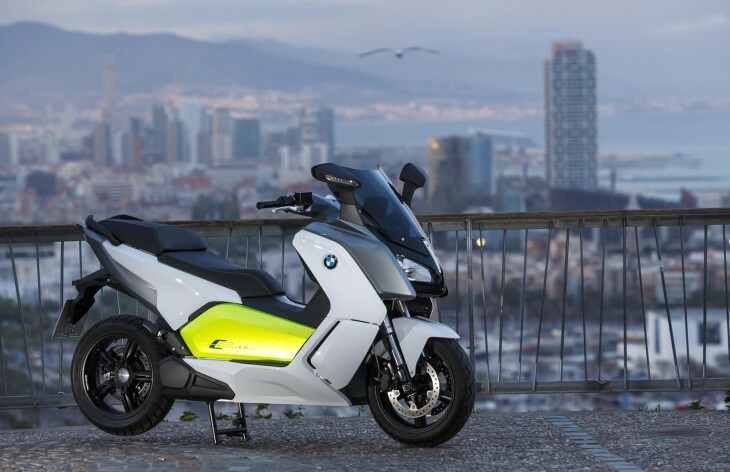 BMW builds the scooter for something like $3250 and sells it for $20 grand because, we’ll, they can. wait, Zuckerberg’s in on Tesla…? Well, since you’re average Euro is a lazy sponge, sitting around for four hours smoking cigarettes while your scooter recharges isn’t such a bad thing. 220 still equals 4 hours so you can go another whopping 60 miles. BMW North America has specifically stated that this product will NOT be available in the US. Did you learn that by reading to the end of my story? I learned it from a direct statement by a long-time employee of the motorcycle division of BMW/North America. Hence the term “specifically stated”. For this bike, anything north of $12K means that it’s DOA. That’s fine with me. It gives Zero and other innovative startups a chance to establish themselves. I wouldn’t pay more than three grand for a scooter (and it better be a darned good scooter for that much wad). Just guessing here but I think you are not the market BMW is going for. Yep. I’d rather ride around on one of Honda’s humble $900 bikes that gets 164 MPG. But I don’t gay that choice either in the Land of the Free.